Digital devices, such as smart phones and tablet computers, are becoming commonplace in young children’s lives for play, entertainment, learning and communication. Recently, there has been a great deal of focus on the educational potential of these devices in both formal and informal educational settings. There is now an abundance of educational ‘apps’ available to children, parents, and teachers, which claim to enhance children’s early literacy and numeracy development, but to date, there has been very little formal investigation of the educational potential of these devices. 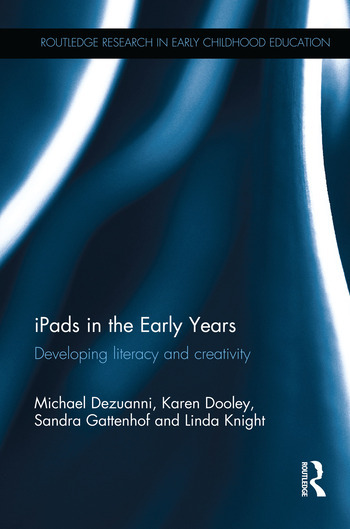 This book discusses the impact on children’s learning when iPads were introduced in three very different early years settings in Brisbane, Australia. It outlines how researchers worked with pre-school teachers and parents to explore how iPads can assist with letter and word recognition, the development of oral literacy and digital literacies and talk around play. Chapters consider the possibilities for using iPads for creativity and arts education through photography, storytelling, drawing, music creation and audio recording, and critically examine the literacies enabled by educational software available on iPads, and the relationship between digital play and literacy development. iPads in the Early Years provides exciting insights into children’s digital culture and learning in the age of the iPad. It will be key reading for researchers, research students and teacher educators focusing on the early years, as well as those with an interest in the role of ICTS, and particularly tablet computers, in education. Michael Dezuanni is Deputy Director of the Children and Youth Research Centre, and a Senior Lecturer in the Creative Industries Faculty and Faculty of Education, Queensland University of Technology, Australia. Karen Dooley is Associate Professor at Queensland University of Technology, Australia. Sandra Gattenhof is Associate Professor and Head of Drama in the Creative Industries Faculty, Queensland University of Technology, Australia. Linda Knight is Senior Lecturer in the Faculty of Education, Queensland University of Technology, Australia.